After an incredible pitching effort on Friday night got the Privateers (5-7) off to a good start in its home weekend series against Arkansas State, UNO dropped Saturday's and Sunday's games to cap a 1-3 week. On Friday, Bryan Warzek turned in another stellar effort, striking out 12 in six innings of work and allowing just one unearned run on a Darren Willis error. Willis later made up for his mistake by tying the game with an RBI single, then winning it with a walk-off single in the 11th, 2-1. John Barr relieved Warzek and threw five shutout innings out of the pen. On Saturday, the Privateers and Red Wolves got involved in a bench-clearing brawl after a non-slide collision at home plate that got starter Kyle Arjona kicked out of the game. ASU's Jaylon Deshazier hit a grand slam in the 5th to break the game open, and they won going away 12-3. On Sunday, UNO starter Reeves Martin struggled, surrendering 4 runs in 4+ innings, and the offense scuffled once again, only mustering one run until they scored two in an attempted ninth-inning rally. 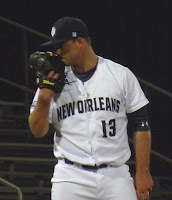 It fell short, though, and so did the Privateers, by a 6-3 count. In their midweek game, New Orleans did manage some offense, but 15th ranked Southern Mississippi managed more, edging the upset-minded home team at Maestri Field, 9-7. Tulane is next for the Privateers to finish the homestand at the Maes on Tuesday night.